It’s not easy to earn a title like “superfood,” but there’s a cereal grass that is so extremely high in chlorophyll, nutrients, and active enzymes that it’s undeniably one. But, it’s rarely eaten. Instead, you see people downing shots of green liquid in health stores. The active ingredient in their shots is wheatgrass, one of the most effective superfoods. Within wheatgrass, you’ll find all eight of the essential amino acids that help you heal and repair damage after you get sick or suffer an injury. You’ll find all the nutrients to keep your body working in top condition for you every day. Wheatgrass also has many of the trace elements that play key roles in your bone health. And, it also packs enzymes—without which you couldn’t digest your food—and antioxidants that provide you the best natural defense against disease. To put it into perspective, a single ounce of wheatgrass juice has as much of the nutrients and amino acids as more than two pounds of green leafy vegetables. And, it also packs plenty of chlorophyll. In fact, 70% of the weight of wheatgrass juice is chlorophyll. Its advocates say it cleanses our bowels, and helps with all elimination systems in the body, including the kidney, the liver, and the bloodstream itself. It also helps kill viruses, fungi, and bacteria. Wheatgrass also contains “superoxide dismutase,” a natural antioxidant. Combined with its vitamin E, beta-carotene, and vitamin C, wheatgrass provides effective protection against the threat of free radicals. 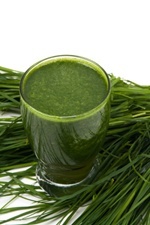 For ulcerative colitis sufferers, drinking wheatgrass juice every day might have huge benefits. One study tested that hypothesis in 23 adults who had active colitis symptoms. They received either wheatgrass juice or a placebo drink for a month. The amount began at 20 mL per day, and gradually rose to 100 mL per day. Researchers found that wheatgrass significantly reduced cases of rectal bleeding, number of bowel movements each day, and even the progression of the condition itself. The magnesium and calcium combination in wheatgrass make it an excellent bone-building superfood. With it, you can help shield yourself from osteoporosis. The immense vitamin A content translates into many benefits. It takes away one big risk factor for diabetes: vitamin A deficiency. It helps keep your vision intact later in life. It boosts your immune system. It helps shield you from conditions caused by viruses and bacteria. The combination of vitamins C and E also provide a great deal of antioxidant protection. They also help keep your blood pressure in check, your immune system at peak condition, your vision solid, and your overall protection from disease high. As impressive as list of health benefits from wheatgrass already is, researchers are still finding out more about this superfood. But, most of the studies on wheatgrass are just backing up what many people already know: it is brimming with essential nutrients, and it’s a major antioxidant. Gaby, A., “Wheatgrass juice for ulcerative colitis,” Townsend Letter for Doctors and Patients August-September 2002.